A not great photo by me showing the Lindbergh beacon in December 2006. I noticed several weeks ago that the Lindbergh beacon at City Hall hadn’t been turned on and I thought maybe I was being premature. But as of last night (Christmas Eve, ahem) the Lindbergh beacon still wasn’t lit. In case you don’t know, the Lindbergh beacon was placed on City Hall to honor a certain aviator who did something rather famous. It was turned off during World War II, during the blackout/dim-out years, and afterward put on display at LAX. 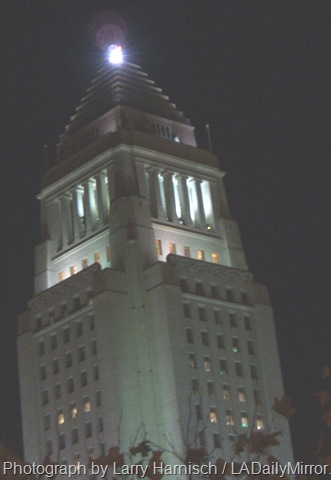 In recent years, it was restored and put back atop City Hall, where it was lit up during the holidays, as shown in this photo from 2006. This year, no Lindbergh beacon. Does anybody know why? This entry was posted in 2006, City Hall and tagged #history, City Hall, downtown, Lindbergh beacon. Bookmark the permalink. 3 Responses to Will Someone at City Hall Please Turn on the Lindbergh Beacon? Not sure why it’s off, but we should ask our new mayor to do something about it. I say light ‘er up! Huell Howser dedicated an entire episode of his show to the restoration of this historic beacon. I just saw Huell Howser repeat of the show. I was wondering if the beacon is being lit. If not, WHY NOT? It’s a part of L.A.’s history.